Somewhere at the crossroads of death, thrash, black, and groove sits Xenoblight. Their debut release Procreation getting down with some nitty gritty riffing that seems to ping-pong back and forth between each of the four represented areas (though admittedly with an emphasis on the death and thrash), it never lacks for energy. Which is precisely what an album like this should strive for. 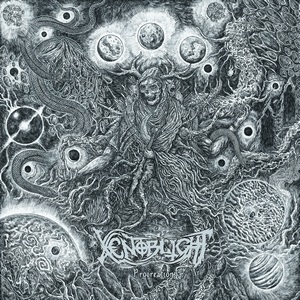 With a solid backbone in both death and thrash, the added nuances of black metal and groove put Xenoblight into a sound that is familiar but has a fresh vibe to it at the same time. Procreation chooses to rage about more than any sort of contemplation, so there is a forward momentum that carries from start to finish, even on some of the lengthier tracks in the album’s back-end. Here more melodic and occasional guitar hero moments shine through (“Nocturnal Manifestations”), and some thrashy bits are able to shine through. Even the 53-second cut “Kill Yourself” leaves nothing but dust in its wake as it barrels through at chaotic speeds. But thankfully, the genre mash-up keeps things varied and interesting, and it’s hard to go through one song (pick one) that doesn’t have some sort of easily enjoyable hook or riff to sink your teeth into. Nothing if not a huge adrenaline rush, Procreation proves Xenoblight worthy of some recognition for their attention to weaving in memorable moments into each of the tracks to make them hold up for the long run. While the final product may not seem too far removed from other extreme acts, they’ve built a very solid foundation on which to further vary things along as they continue to up their game.